For long-endurance missions, the Dornier 228’s long cabin accommodates multiple workstations and observer seats, with room for a rest area and space to meet the crew’s physiological needs. Ruag Aviation (Hall4, Stand 41476) is shifting the focus at the Farnborough Airshow 2018 from its support and integration services for civil and military aircraft, and wearing its OEM hat in highlighting the versatility of the Dornier 228 New Generation Multirole twin turboprop STOL platform. As the “New Generation” name implies, this is a modern version of the aircraft initially produced by Germany’s Dornier from 1981 to 1998, and later by Hindustan Aeronautics, before the Swiss company began producing this variant in 2009. Incorporating more than 350 design changes including a new composite five-blade propellers mated with Honeywell TPE331-10 engines, glass cockpit, and customizable sensor packages, it’s the “perfect mix of a mature design and innovative technologies,” according to Ruag. The only third-generation aircraft in its class, the Dornier 228 has been purposely designed to match the FAR23/CS23 commuter category airworthiness standard, which assigns safety margin equivalents to transport category aircraft. Ruag cites its range, payload, high utilization rates (a dispatch reliability of over 99 percent) and operational costs as the platform’s key features. Additionally, due to its advanced aerodynamics, the Dornier 228 can match or exceed the STOL performance of competing aircraft at the same payload (2,040 kg/4,497 pounds), all while cruising up to 50 knots faster. Maritime patrol missions include pollution control, search and rescue, border control and fishery patrol. Other routine assignments are research; surveillance and reconnaissance; and light transport operations including cargo, paratrooper, passenger, and medevac. This has made the Do 228 the “platform of choice for special-mission operations performed between low level and 10,000 feet msl” by military and government law-enforcement organizations, the company said, with the fleet accumulating more than four million flight hours to date. Sensors and mission systems can be customized for each aircraft, with Ruag’s aerodynamic expertise and system integration experience ensuring a seamless integration of sensors and mission systems. Typical installations for a multirole configuration can include Side Looking Airborne Radar (SLAR); Search/Surveillance Radar; SAR Direction Finder (SAR/DF); Automatic Identification System (AIS); Electro Optical/Infrared (EO/IR); EI/IR + SAR = Optimal Sensor package; Visible (VIS) Line Scanner; Ultraviolet/Infrared (UV/IR) Scanner; and Microwave Radiometer (MWR). For the crew, the Dornier 228 ergonomics, large field of view, and comfortable environment substantially reduce fatigue and workload, facilitating a high level of vigilance throughout low-level operations and long missions. That starts in the ergonomically designed cockpit, anchored by four large sunlight-readable HD displays, providing pilots with the specific information required during each phase of the mission and reducing pilot workload. In the cabin, the optimal rectangular fuselage cross-section makes installing even large operator consoles a simple task and provides the crew with a high level of maneuverability and comfort, and a safe path for evacuation in the event of an emergency. It can be equipped with various combinations of forward- and side-facing seats, and double stretcher, as well as intensive care stations. The ambulance transport layout may be easily combined with trooper and paratrooper transport layouts. Seats can also be quickly removed to convert the cabin for cargo; to ease loading, the normal passenger door can be opened sideways, which together with the adjacent door, creates a massive opening for bulky or heavy cargo. 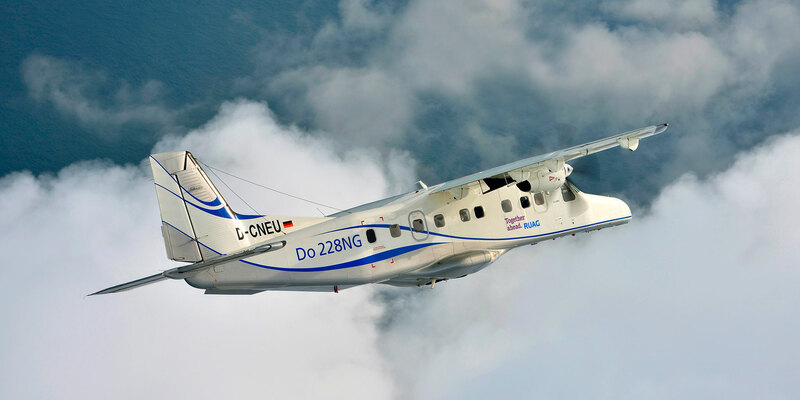 Thanks to its cabin design and endurance and range—up to 10 hours aloft on loiter and a range “well in excess of 1,000 nm,” according to Ruag—the Dornier 228 is well suited for long missions, designed for three-shift operation. The long cabin can accommodate multiple workstations and observer seats, with room for a rest area and space to meet the crew’s physiological needs.